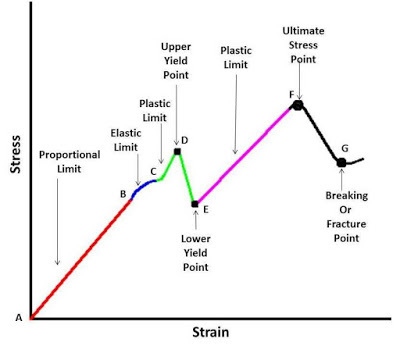 Before learning about the young modulus you should know about strain and strain. I am giving a brief introduction to them. If you want to learn them completely, kindly follow the link given below their definitions. Resistant Force applied per unit area of any cross section is known as stress. For ideal conditions, the applied force is equal to the resisting force so the ratio of the applied force to the cross-section area of an object is known as stress. It is the resistant force which resists the deformation in anybody. For more detail click Stress and its Types. For understanding, this elastic constant, first, read the diagram given below. It is stain strain curve for a ductile material. This diagram is obtained by applying an increasing load on a specified dimension specimen and observe its behavior and change in dimension. The region AB is known as proportional limit and AC is known as elastic limit. Under the elastic limit, the stress is directly proportional to the strain. This law is known as Hooke’s law. The proportionality constant of Hook’s law is known as the young modulus of elasticity. 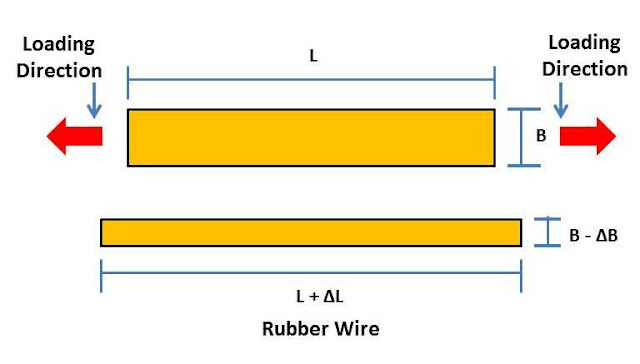 The ratio of direct stress to longitudinal stain under the elastic limit is known as the young modulus of elasticity. Its unit is the same as that of stress which is newton per meter square (N/m2). This constant is independent on any constraint like the dimension of the object, applied load etc. and unique for every material. It is only depended upon material type and varied for material to material. We have discussed that every unique material has a unique value of young modulus. If a material has a high value of this constant, it means that this material specimen or object required a high value of force to little change in its original dimension. It is less elastic or that material got a little variation in its dimension for a high value of stress. It can say that the high value of modulus shows high rigidity of the material. The value of this modulus for steel is 210 GN/m2. If a material has the low value of this constant means the material is highly elastic or it shows a very high deformation for a small value of loading. The value of young modulus of aluminum is 70 GN/m2. This is complete information about young modulus of elasticity at beginner level. If you have any query regarding this article, ask by commenting. If you like this article, don’t forget to share it on social network with your friends. Subscribe our website for more informative articles. Thanks for reading it.